Friday 25th. A WSW'ly wind that was quite variable in strength meant it was a day of ATing off runway 24. 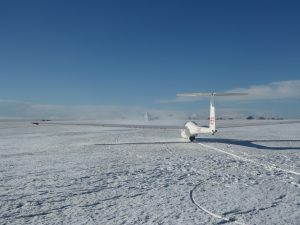 Although the wind speed varied, the hill and weak wave provided consistent lift that resulted in all 5 flights exceeding an hour, although no significant climbs were recorded and all the flights stayed relatively local. Nigel Burke took the first launch solo in the DG500 and landed 1:10 later, being followed by Steve Ogden in the DG303 who had 1:05. Paul Whitehead and Tracy Commander then posted the longest flight of the day, 1:41 in the DG500, while Alan Beaumont, 1:01 in Astir DPO and Duncan Pask with 1:32 in Astir HVK completed the pure glider flying for the day with the Falke having a single sortie. Saturday 26th. Saturday dawned with a moderate SSW'ly blowing, though this backed into the SSE later in the day as frontal cloud increased and rain arrived around 1630 hrs. The last of the day's 7 launches landed at around 1415 hrs, Graham Evison's flight with the second of the day's First Flight pupils in the DG500 having been limited in launch height by the lowering cloud base. Prior to this, the launch method had included both winch and ATing, with John Marsh taking the first winch launch off runway 24 in the DG303. John found the hill lift to be inconsistent due to wave interference, but hung on at relatively low levels and was eventually rewarded with a climb to 4,300' asl over Coxwold in his flight of 1:36, the only flight to exceed an hour. 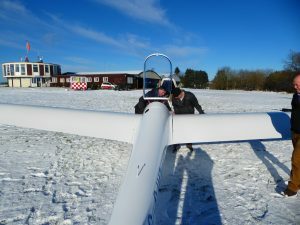 Two of the day's flights exceeded 30 minutes, Robin Hutchinson and Tom Wiseman having 40 minutes in the DG1000 off one of the day's two ATs, while Paul Whitehead and Lisa Briggs, the only First Flight pupil of the day, had 37 minutes in the same glider, but this time off a winch launch. Sunday 27th. 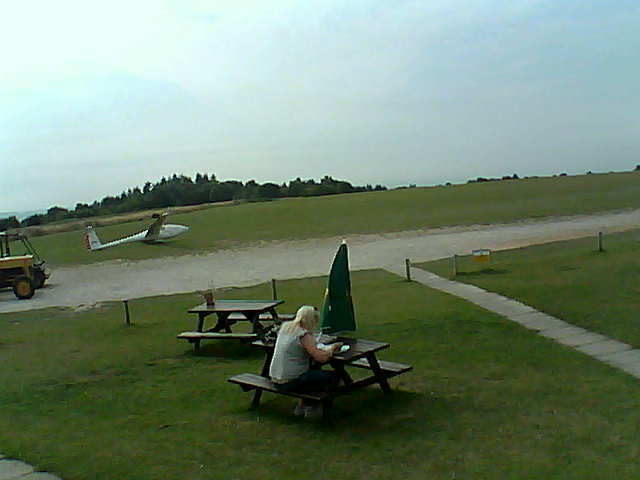 A moderate to fresh NW'ly, which gusted above 50 kts, meant it was a non-flying day. Monday 28th. 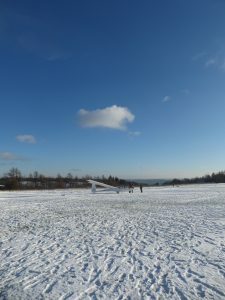 A sunny day found the airfield snow covered and although the initially NW'ly wind moderated over the course of the day and backed into the W, the change came too late for flying to start. Tuesday 29th. A eastward travelling front brought in low cloud from the start on a light to moderate SE'ly, with rain from 1400 hrs that turned to snow. As a result. there was no flying. Wednesday 30th. A predominately sunny day with a light NW'ly blowing, saw ATing off runway 24 of a snow covered airfield commence just before lunch and continue until just before 1700 hrs, with 10 flights recorded, including 3 for First Flight pupils. The conditions aloft were benign, with excellent visibiity and silky smooth air and although the lack of any lift meant no-one exceeded 30 minutes flying time, except for those in the Falke which added 2 to the day's flight total, those who flew appreciated the attractiveness of flying on such a day. Paul Whitehead's 26 minutes with his First Flight pupil in the DG500 turned out to be the longest flight of the day, closely followed by the 25 minutes achieved by George Rowden with each of the other 2 First Flight pupils, as well as by Duncan Pask in Astir HVK. The day saw Ken Arkley return K21 JVZ to site after its ARC, and it was soon rigged and taken up for a post rig test flight by John Carter and Geoff Turner. 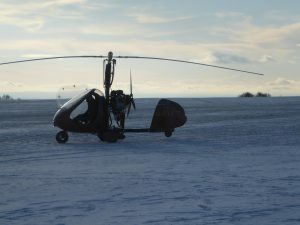 Pawnee EV and the DG500s snowy take off is shown in the first of the following photos, with the second showing JVZ during its rig. The 3rd photo shows evidence of a January thermal and cloud did build up by mid-aftenoon, but provided little if any useable lift, cloud base being around 2,000 ' QFE. The last photo shows the day's visitor taxying to runway 24 before departing the airfield.